722, like her sisters, was built just 20 miles away from Blackpool at English Electric works in Preston in 1935. Just like all the other Balloon Cars (other than Balloon 710 which visited Crich Tramway Village in Derbyshire during the 1980's) 722 never left Blackpool. 722 started life as Balloon 259 back in 1935 and soon after delivery to Rigby Road depot in Blackpool, started work on the Lytham Road route, operating between Squires Gate and Cabin or Bispham. When not operating on services, 259 may have found use on promenade specials and from 1958 specials to North Station and to Fleetwood ferry especially on Market Days. 259 would also have seen some use on School Specials on the Marton Route. From 1961 after the closure of the Lytham Road route and the Marton Route in 1962, 259 and her sisters would have mainly have been confined to operated on Promenade specials. In 1968, Balloon 259 was renumbered and became balloon 722. 722 became the last balloon to receive single destination blinds, not doing so until 1980. Following an overhaul in 1992, 722 received attention to her underframe and was also fitted out with bus style seating on the upper deck to replace the more traditional swing-over seats. 1998 saw 722 receive the first of 2 all-over liveries, this being for Pontins holiday camp at Starr Gate. 722 was involved in a serious derailment in 2001, whilst returning to depot following service one windy night in July, 722 hit a sand drift which had covered the track and the front bogie jumped off the rails and the tram lurched to the side landing on the dual carrigeway and lodged against an overhead line post. Fortunately no one was injured and there was no cars on the road at the time. 722 was soon towed back to depot minus its front bogie. 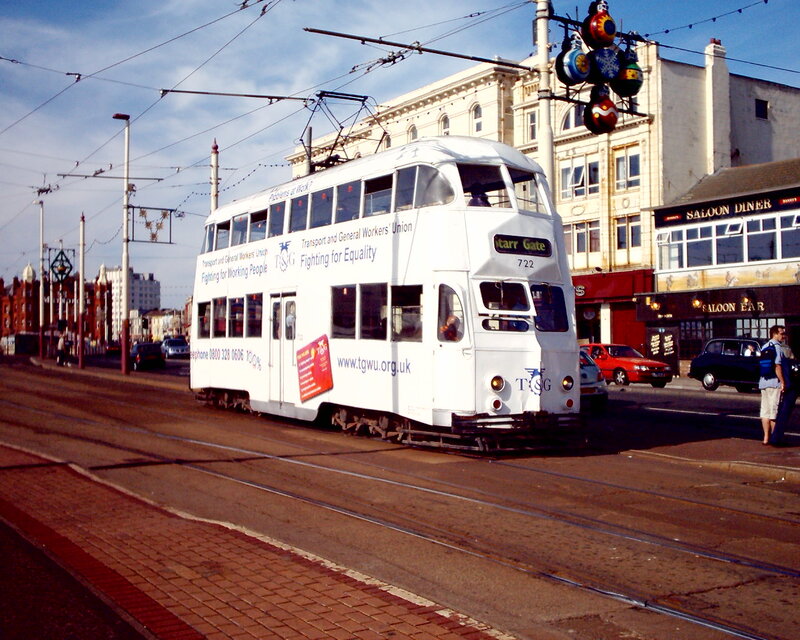 The tram also suffered some panel damage and a smashed window, but returned to service a few weeks later. In 2004 the tram was surprisingly stored as part of the mothballing of 25 cars in the fleet. Even more surprising was that this happened following water proofing works taking place on the upper deck just a few weeks earlier. The withdrawal didnt last long as there was an over-subscription of adverts and not enough trams to carry them meaning that 722 was reinstated in July 2005 this time with a new all over advert for the TGWU in a mainly white base coat. 722 saw a further 2 years service. However in October 2007, 711 ran into the rear of 722 at Admiral's Point causing damage to the underframe. With the return to service of recently restored 717 expected in 2008, 722 was withdrawn and dumped in the depot and declared surplus to requirements. During the following 2 years 722 was gradually stripped of any parts which could be reused on the other balloons. Also during 2009 722 became the test tram for widening the doorways to allow door pods to be fitted to the balloons which would be retained for service after 2012. 722 languished on at the rear of the depot until October 2009 when there was a free slot in the body shop which would allow for the scrapping of the tram. So on Thursday 15th October 2009, work began on dismantling 722 following 71 1/2 years of loyal service and 2 1/2 years of storage meaning a stalwart of the tramway for 74 years is no more.